Note: you will work a sc in each dc and a dc in each sc, your last st worked will be in the beg ch1. Rows 3 – 19: Repeat Row 2. Fasten off after last repeat. Border: With right side of flap facing you, join Yarn in side marker, ch1, starting in Row 2 of Flap, sc around entire flap, working 3 sc in each corner to get a smooth turn, sl st to 2nd side marker. Do not fasten off – continue with handle. Ch150 or amount to achieve handle length desired, sl st to opposite side marker, now working around chain, sl st in each ch, join to purse. Fasten off. Sew button in place.To line the bag, you can use my tutorial as a guide, find it here. Love it! Only comment is pattern instructions says you used only 2 colors, but pictures show 4. Do you need 1/2 skein of 4 colors or 2? I’ve updated the pattern to clarify, thanks for letting me know! I made one similar to this, Made it the size of my cell phone and put a pocket on the bottom for my money, it is great for going to garage sales and flea markets, no heavy purse. Thanks for the pattern. I love this technique. Reblogged this on Donna's Crafy Creations123. 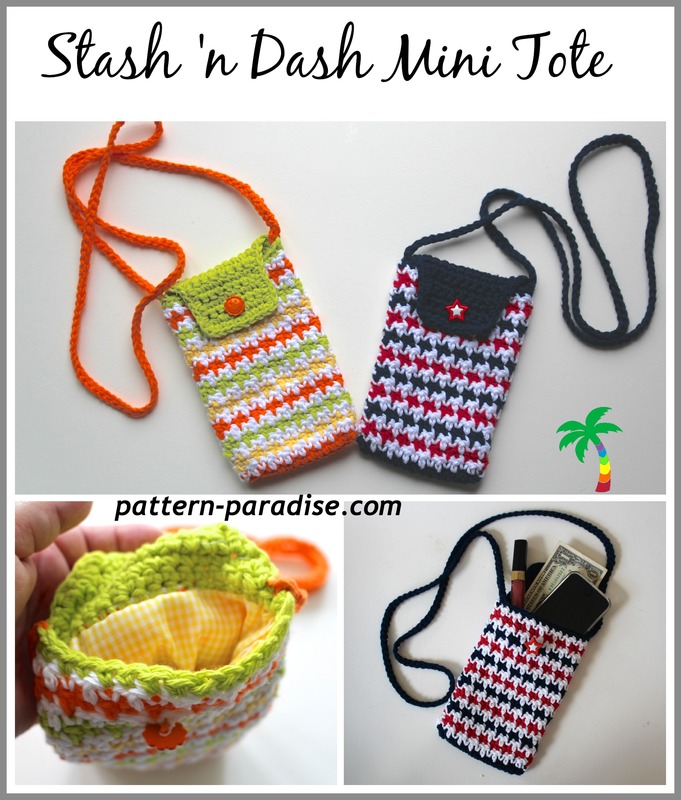 can you show a tutorial on how you add the lining of the phone pouch and clutch as well? thank you. I don’t have one specifically for the totes, but I have a generic one for lining crochet bags. You should be able to use this as a guide. Adorable! I’ve already made three! Wow! That’s something new for me! Thanks a lot for this free pattern! Super cute, love the stitch!